For 3,300 years the Exodus story has been the core of Judaism and Christianity and it has inspired numerous Liberation struggles throughout history. We need to understand and re-imagine the Exodus Story for our time. This class with Rabbi Dan Goldblatt and our friends from Beth Chaim will connect our personal stories with univeral meaning as it insists the necessity of creating a future as spiritual siblings. BEGINNING TOMORROW, WEDNESDAY: Re-imagining Exodus – A Freedom Story: The story of Exodus is pivotal in Jewish and Christian communities. Rabbi Dan Goldblatt and Pastor Steve will teach this class over four Wednesday evenings beginning Feb 28, 7:30p at Peace. Show up one night, two nights, the entire series… you’re welcome to any and all of the classes! Simple Soup Supper at 6:45p, followed by class teaching. Series continues each Wednesday, 3/7, 3/14, and 3/21 at Peace. At our final class on 3/21, author Rabbi David Zaslow will be with us! Purchase your copy of the book today – $10. The book is important, even if you cannot attend – it is the core of the Lenten experience. 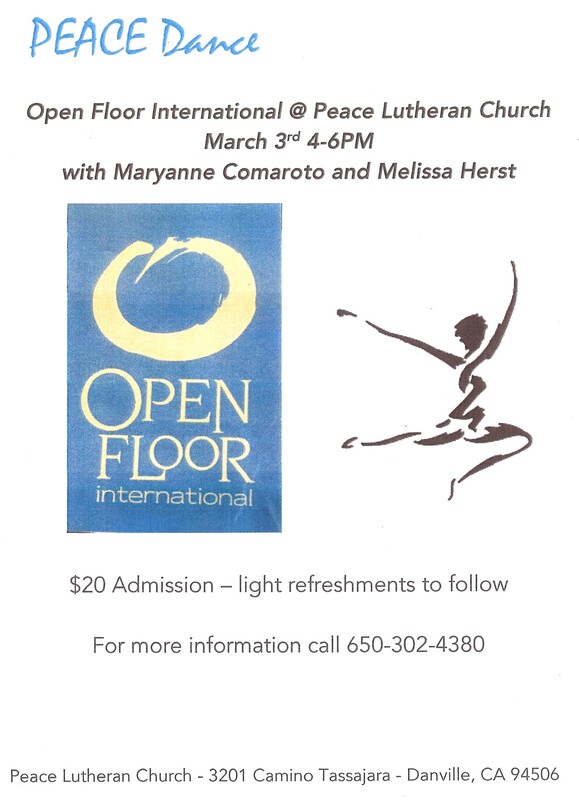 Peace Dance with Open Floor International – Saturday, March 3 from 4 – 6 pm. Come Sweat your Prayers and move to the joy of music and movement. Happy Hour for Hunger with the Jazz Church West – Sunday, March 4 following the Kristen Strom Quartet performance at 5:00pm, a Fundraiser for the ELCA World Hunger. Fresh grilled Taco Bar with Craft Beer Tasting, fine wines, and non-alcoholic lemonade and fiesta horchata! Speaker Sharon Magnuson from our national church office in Chicago will give a brief presentation on the outstanding work our Church has done for decades to alleviate hunger in the US and abroad. Invite friends to join you in this evening dedicated to superb music and essential support for hungry families. Please keep in your prayers: Eric and Julia Nieman who honored Rita at the Memorial gathering this weekend. Don Britt on the death of Linda, Brian, Bob, David, Gun, Drew, Sue, Dennis, Ed, Danny, Mike, Zach, Michael’s father, Goran, Spoon and Liz, Pastor Lucy, disabled people, and the students, staff, and families who were killed or survived the recent Florida mass shooting. Condolences to Isaac on the death of Naftali. Special Thank you to our Mask Making participants for your Sunday Worship presentations! Kaleo and Elise Ching; Shree, Ariya, and Diya; Christa, Jack and Coreen; Mary LaCasse, and Louis Moehlman. “How Did We Get Here?” We begin celebrating our 60th Anniversary as a Congregation on February 25 in worship and at the Forum. You will get to hear stories and memories about Immanuel Church (merged in 1988 with All Saints to create Peace). Throughout 2018 we will be learning about our history and discerning our future. Re-imagining Exodus – A Freedom Story: The story of Exodus is pivotal in Jewish and Christian communities. Rabbi Dan Goldblatt and Pastor Steve will teach this class over four Wednesday evenings beginning Feb 28, 7:30p at Peace. Simple Soup Supper 6:45p Continuing 3/7, 3/14, AND, at our last class, on 3/21, author Rabbi David Zaslow will be with us! Purchase your copy of the book today – $10. The book is important, even if you cannot attend – it is the core of the Lenten experience. Last Friday Films: Wonder Woman! Fantastic Food, Fun, and Film!!! Why do teenage girls and boys around the country love this movie? Maybe it’s because of director Patty Jenkins’ (Monsters) role as the first woman to direct a superhero film. When Chris Pine lands near the Amazon’s island, he tells them of WWI raging across Europe. Diana says, “I am willing to fight for those who cannot fight for themselves.” She believes her calling – to help stop the war and end humankind’s suffering. Will she discover her powers and her fulfill destiny? Run time 2 hrs. 21 min. ; rated PG-13 – Parents Strongly Cautioned – Some material may be inappropriate for children under 13. Common Sense Media Rating: 12+, kids say 11+. If you wish to be removed from this list, please let me know. Please keep in your prayers: Eric and Julia Nieman whose mother Ritas Memorial gathering is this weekend. Don Britt on the death of Linda, Brian, Bob, David, Gun, Naftali, Drew, Sue, Dennis, Ed, Danny, Mike, Zach, Michael’s father, Goran, Spoon and Liz, Pastor Lucy, disabled people, and the students, staff, and families who were killed or survived the recent Florida mass shooting. Mask Making Workshop with Kaleo and Elise was incredible!! You will see the fruits of their labor this Sunday. Peace as Sanctuary: The LIRS / Lutheran Immigration & Refugee Services report on the ELCA Sanctuary Movement was presented this past Sunday. Visit the LIRS link – https://www.lirs.org/blog. We are intending to speak with LIRS staff by Skype on a Sunday Morning in March. 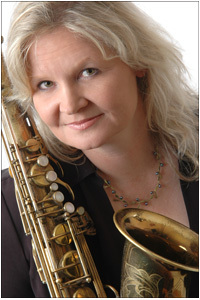 Happy Hour for Hunger with the Jazz Church West – Hosted by Melanie and Frank Hobden: On Sunday, March 4 following the Kristen Strom Quartet performance at 5:00pm, a Fundraiser for the ELCA World Hunger program will present Speaker Sharon Magnuson from our national church office in Chicago. Our church has done outstanding work for decades to alleviate hunger in the US and abroad. In addition we will have a Craft Beer Tasting with a local expert to highlight the latest trends in this industry. Invite friends to join you in this evening dedicated to superb music and essential support for hungry families. Aging in Place – The Facts behind Senior Hunger: Nearly one in every six seniors in America faces the threat of hunger and not being properly nourished. This applies to those who aren’t sure where their next meal is coming from and those who don’t have access to the healthiest possible food options. The issue is severe enough that the AARP reports that seniors face a healthcare bill of more than $130 billion every year due to medical issues stemming from senior hunger. The full article is posted on our website. Reclaiming the Heart of Humanity: At the final judgment we are asked: Were you honest in business and life? Did you set aside times for learning? Did you look beneath the surface? Did you ponder the inner meaning of what you saw? Did you live with hope? Delegation to Nicaragua: We are exploring the possibility of a delegation to Nicaragua in September or December. If you are interested please send your date availability to the office at Office@PeaceJourney.org with Delegation in the subject line. Annual Congregational Meeting: The Annual Report itself is quite an endeavor. Therefore links to each of the Reports are provided below (end of blog). I hope you will give read, absorb all that is happening through our ministries within and beyond Peace. I hope the Report will make you proud and prompt insights and questions about our ministries. Bambalela – Never Give Up! The Family Service was a joyful celebration. The only critique: It was too much fun! The Kid’s Art was beautiful and remains on our altar; Kaleo and Elise’s masks were stunning, Nette’s cards and song for immigrant friends “What a Wonderful World” touched our hearts; and all the love from our kids and for the Danville Village elders made it a true Valentine’s and Mardi Gras event. Thanks to Charlene and Pat for their leadership. Ash Wednesday begins the Season of Lent tomorrow night with worship at 7:00 pm. We will use Marty Haugen’s Vespers Service. Please keep in your prayers: Don Britt on the death of Linda, Brian, Bob, David, Gun, Naftali, Drew, Sue, Dennis, Ed, Danny, Mike, Zach, Michael’s father, Goran, Spoon and Liz. Re-imagining Exodus – A Freedom Story: The story of Exodus is pivotal in Jewish and Christian communities. Rabbi Dan Goldblatt and Pastor Steve will teach this class over four Wednesday evenings beginning Feb 28, 7:30p at Peace. Simple Soup Supper 6:45p Purchase your copy of the book today – $10. The book is important, even if you cannot attend – it is the core of the Lenten experience. – There is so much going on. I am missing out by not being at Peace more often! – The church has a very strong foundation of accountability and solid financial stewardship. – A sense of purpose and community provides very strong bonds. – I have been a member in several Lutheran congregations around the world where strife and infighting was the order of the day. The forums are very valuable in resolving issues and charting the path forward. Mask Making Workshop with Kaleo and Elise — this Saturday 9:30 – 5:30 and Sunday from Noon – 5 pm. If you wish to participate please notify the Office promptly. ELCA Advocacy Alert: This week the Senate will vote on policies that could provide protection for young Americans without legal status, also known as Dreamers. During the same voting process, Senators will also consider amendments that restrict immigration to historic lows, take away trafficking protections for unaccompanied children, make it harder for people to seek asylum, and increase border enforcement. Policies that harm children and families do not reflect our commitment to God’s call to welcome the stranger and care for our neighbor. Forum: Peace as Sanctuary this Sunday 2/18 — LIRS / Lutheran Immigration & Refugee Services: A report on the ELCA Sanctuary Movement was made available this past Sunday. To see it online and prepare for this Sunday visit the LIRS link – https://www.lirs.org/blog. “How Did We Get Here?” We begin celebrating our 60th Anniversary as a Congregation on February 25 in worship and at the Forum. You will get to hear stories and memories that shaped the origin of our congregational life. And you will get to learn more throughout this year. Last Friday Films: Wonder Woman! Fantastic Food, Fun, and Film!!! “To be born a human being is rarer than a star that shines by day.” Tibetan saying. Family Service this Sunday: We will celebrate Valentine’s Day, Mardi Gras and Transfiguration. Am I missing anything? 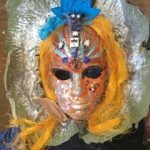 Colors, music, masks, dancing and love – what more do you need? Bring your kids and grandkids. Mask Making: Feb. 17 and 18 Kaleo and Elise are leading the Mask Making Workshop at Peace. Members and friends of Peace are invited to join in to this wonderful, transformative process. Speak with me about details. 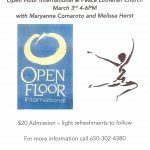 Peace Dance- Saturday, March 3, 4 – 6 pm: John and Elizabeth invite you to join them and Open Floor International for Embodied Prayer through dancing for the joy of it. Affectionately called ‘Sweating your Prayers‘ this occasion provides music and rhythms to move within and just be. (Up until the 14th century no liturgy was considered complete without 1 – 3 dances!) Children are welcomed. Suggested donation – $20. Faith, Hope and Love: Honoring our immigrant guests of a couple weeks ago, Nette has prepared Cards of Appreciation with which to remind our friends that they are not alone. If you wish to include a financial gift (made out to Peace) that will be welcomed too. Cards are available again this Sunday. Ash Wednesday, the beginning of Lent is on February 14. Our service will be at 7:00 pm and we will use Marty Haugen’s Vesper Service. If you need transportation please let the Office know. “The whole cosmos is in Communion: We are stardust, literally made of the stars. And certainly the ‘reverse’ is equally true – The Cosmos is made of our Flesh and thus we are interconnected with everything else in the cosmos! Our Lenten Season will be a Study of the book “Exodus” which Rabbi Dan Goldblatt and I will teach at Peace beginning on Wednesday, February 28 at 7:00 pm – Soup and bread will be served at 6:45. To learn more about the Exodus Story and it’s liberating significance for Jews and Christians see this interview with author Rabbi David Zaslow: https://www.youtube.com/watch?v=74A58GZ_VoI. Copies of the book will be available this Sunday. From Seminarian Louis Moehlman: I am on Facebook reading some pretty terrible news. A young high school student, Patrick Turner, in Newport Beach came to the conclusion that ending his life was perhaps the only way to make a statement to those who have created ever growing pressure around children to do well. Newport Beach is ranked nationally as the “4th wealthiest city”. Following San Ramon and Pleasanton, respectively. I can only imagine the immense pressure to do well, out perform and succeed, as Patrick felt in Newport Beach, is not an unfamiliar feeling with the youth we serve at Peace. Please keep our young people in your prayers. The Jazz Church West presents the Glen Pearson Quartet this Sunday at 5:00 pm. The gift of grandeur and deep contentment await you. Happy Hour for Hunger for Jazz at Peace – save the date – March 4 at 5:00 pm! Melanie and Frank Hobden are creating a Fundraiser to support the work of the ELCA World Hunger and Disaster Appeal through our national church body. 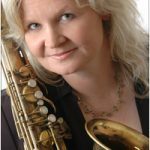 The Kristen Strom Quartet will perform for the Jazz Church West, Hors d’oeuvres and Craft Beers provided by local experts will be highlighted during the Reception after jazz, and Sharon Magnuson from the ELCA Chicago Office will share news on this life-changing work to end hunger. Spread the word and plan to attend. Sermons for All Seasons: Through the kindness of friends, a book of Pr. Lucy’s sermons has been published and is now available on Amazon. It costs $10.95. A portion of the proceeds benefits Peace. You can preview a copy at Hospitality on Sunday. Any royalties will be dedicated to PICO for organizing work done in Rwanda under the leadership of Rev. John Rutsindintwarane. Please keep in your prayers: Linda, Sue, Zack, Pr. Lucy, Liz, Johnny’s mom, Michael’s dad, Dennis, Danny, Brian and David and Bob, Drew, Ed, all the jazz musicians who perform at Peace, all of our families working so hard to raise wise, compassionate and joyful children. Speak with Jim Gunshinan about his father’s work on the Hubble Telescope to learn amazing stories. Our next Family Service will be on February 11. Our Annual Congregational Meeting will follow worship on that day. It appears it will be a brief meeting. Last Friday Films viewing of “Happy” last weekend garnered an audience of 20+ people. Good film, good cooking by Ken, good friends, good times. Thanks, Elana! Fields of Blood: Religion and the History of Violence by Karen Armstrong. This in-depth historical study of the world’s 5 Major Religions reveals that religions are not the source of violence and wars. I mentioned this in last Sunday’s homily and Armstrong’s work is a fine piece of truth telling. While this is hard for many of us to believe, this platitude has caused enough damage. (Name the religious cause for our American Revolution, 1812, Civil War, WWI and WWII, Viet Nam and Iraq.) Read the book and then we’ll talk. 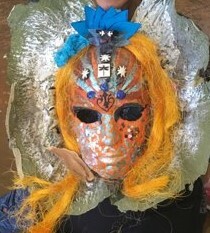 Mask Making Workshop at Peace lead by Kaleo and Elise on February 17 and 18. Youth and parents from Peace and Beth Chaim will be participating. Would others of you like to join in? Laurie England sends her love from Longview, Washington. She is glad for her move but misses her Peace friends. The Jazz Church West hosts pianist Glen Pearson on Sunday, February 11 at 5 pm. This is on the 2nd Sunday of the month due to Super Bowl. The Church Year which is based on a lunar calendar has all of our Feast Days as early as they can possibly be this year. Ash Wednesday falls on February 14/ Valentine’s Day and Easter will be celebrated on April 1 the Fool’s Day. The Lenten Class on Exodus that Rabbi Dan Goldblatt and I will teach will begin on February 28 and go for an additional 3 Wednesday evenings. Copies of the book by David Zaslow will soon be available for you.